The contradiction is, as you can see, the disk takes 41GB of space, but if you sum up the sizes of its folders you’ll only get 29GB. The space gap is around 10GB, the same size as the photos and videos combined, which are nowhere to be found. I’m confused, if you have any idea how to solve this issue please let me know. There are two issues here. The first is that the Storage indicator is not particularly reliable. You may want to try re-indexing Spotlight, which is used to identify the categories. Secondly, the visible folders are not everything on your disk. 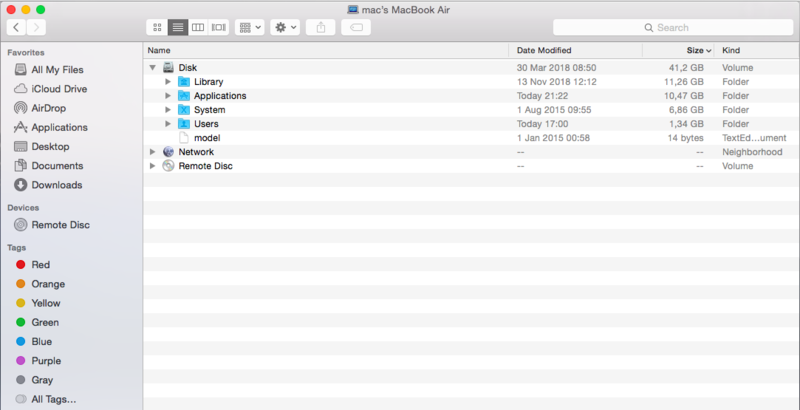 MacOS can store 'local backups' on the system disk - normally these would be listed as "Backups", but if the identification process fails, then they might be listed as "Other". Normally, you don't need to worry about these filling up the disk, as the OS will manange it. There are special utilities such as DaisyDisk and OmniDiskSweeper, which list all file hierarchies by size, allowing you to drill down and discover which files are taking the most space, and then delete them. Try checking System Storage in Safe Mode, then restart. Not the answer you're looking for? Browse other questions tagged macbook hard-drive storage spaces disk-space .